Obamacare on Social Media – #Win or #Fail? The Obama administration is no stranger to social media. Widely regarded as the first ‘social media’ presidential campaign, networks like Facebook and Twitter were instrumental in President Obama’s win in 2012. It seems only fitting then, when faced with the daunting task of getting at least 7 million Americans insured under the Affordable Care Act (ACA) by the March 31st deadline, the administration turned to the Internet and the social media platforms it has been expertly using for years now. The ACA has been implemented across the country under the healthcare.gov website, but 17 states including “red” states such as Idaho and Kentucky, and “blue” states like New York and California, have established their own state health care exchanges. Here, citizens can compare insurance policies, find out if they qualify for Medicaid, and get enrolled under the provisions of the Act. Each of these state exchanges had their own enrollment goals, and all of them have official Facebook, Twitter and YouTube accounts to promote awareness and provide support for interested citizens. Aside from these, the national HealthCare.gov website itself fronts its own accounts on Facebook,Twitter and YouTube. The map below points out those states that ran their own health insurance exchanges. In the last two weeks before the March 31st deadline, President Obama led a whirlwind tour of promotion to get more people interested and enrolled. From his March 11th appearance on Between Two Ferns with Zach Galifinakis, and his Q&A session on social networking site Quora, there was no stone left unturned to get the word out about the upcoming deadline. With the accessibility and reach of social media, many of the state exchanges ramped up their social media presence as well in a bid to reach their enrollment goals. Covered California, Arkansas Health Connector, Access Health CT (Connecticut), Cover Oregon and Washington Healthplan Finder featured apps on their Facebook pages, while HealthCare.gov – the national website and MNSure integrated their Twitter and YouTube feeds into their Facebook profiles. Of these, Access Health CT’s “Anything Can Happen” app had the highest MAU or Average Monthly Active Users count of 372, while the app with the next highest MAU was Covered California’s “Shop and Compare” (279). The Anything Can Happen app seems crafted for the 18-24 demographic that was the crucial block of this enrollment. With a three step questionnaire, the app creates an example of what could go wrong at a concert, leading to the inevitable question of “Can you afford a trip to the ER?” – a smooth segue into the Exchange’s website. Covered California’s app is more practical and allows users to compare policies based on their personal information. In the last two weeks of March, engagement on Facebook was high across most of the state exchanges. Maryland posted the most updates between March 15th and March 31st – a grand total of 102 times, including 20 times just on the last two days! The posts were a mixture of plain text, links, photos and two videos – all of which encouraged fans to enroll, offered useful information and supplied links to customer assistance and upcoming events. Even with the number of posts so high, the engagement score* for Maryland through this period was a respectable 374. Engagement Score – Engagement is the measure of audience responses to a brand’s content and activity on a social network. To calculate the engagement score, we weigh audience interactions on brand content such as Likes, Comments, Shares or Favorites, Replies and Retweets based on their importance. We then divide their weighted sum by our estimate of the number of brand fans and followers who actively receive and view such content. The New York State of Health Exchange was one of two Exchanges that managed to garner a perfect engagement score of 1000. Many of the conversations on posts acted like a secondary channel of customer assisstance where the exchange tried to clarify users’ concerns. New York also had the highest increase in fans in the last two weeks before enrollment, with a jump of almost 33%. To put that in perspective – the next highest rate of increase was Rhode Island at only around 8%! Meanwhile, Covered California, with a growth rate of 6.4%, gained the highest number of fans – adding 11,056 new fans in the time period, bringing their total number of fans to 185,383. The only exchange with a higher number of fans is HealthCare.gov, which caters to all the other 31 states combined. The exchange with the second highest number of fans – Connecticut — is miles behind California with a little less than 32,000 fans. California was obviously doing something right, because they managed to maintain an impressive engagement score of 963, even with such a large number of fans. Usually we find that as fan numbers go up, engagement inevitably decreases, but California seems to be a clear exception. Their 17 posts had a total of 11,970 Likes, 8,031 Comments and 3,879 Shares. Amongst their posts were three videos – one featuring basketball superstar LeBron James. Both New York and California also updated their enrollment numbers periodically on their pages, giving fans an idea of the number of people who had already started the application process. It’s a similar story on Twitter as well, with California locking down the highest number of followers amongst the state exchanges. Also mirroring Facebook, New York had the highest growth rate – 21.5%, and California had the highest jump in terms of number of followers – 4,927, in the last two weeks of March. New York had the highest engagement score in this time period, followed closely by Cover Oregon, although the former tweeted about 12 times more than the latter. While the 18 different accounts were created to scatter the seeds of information far and wide, they also seemed to scatter the conversation a little bit, in terms of aggregating engagement. Except for Idaho, all the other Twitter accounts together used the #GetCovered hashtag a total of almost 4,000 times in the last two weeks alone. HealthCare.gov was responsible for a little more than 2400 uses of the hashtag, and California followed with about 550 uses. HealthCare.gov used the hashtag #GetCoveredNow about 3200 times, and this was also used by some of the state exchanges. The state exchanges did try to put a unique stamp on their individual hashtag strategies. Almost all the exchanges used an exchange-specific hashtag, such as #getcoveredct (Connecticut), #askmnsure (Minnesota) or #askyhi(Idaho). Minnesota actually had two great hashtags that acted as calls to action – #MarchToEnroll for the whole month, as well as #20Days20Stories, which highlighted 20 stories of people who had successfully enrolled for insurance. In the table above, we’ve ignored Healthcare.gov, and focused only on the state exchanges. We’ve also discounted #getcovered and its variations-#getcoverednow, #getcovered,etc, the names of exchanges, and general words like #financial, #save,etc. Of the 19 accounts- including HealthCare and Arkansas (which is primarily an information source, no enrollment takes place on their website), Covered California was the most prolific tweeter, followed by New York. However, it was Maryland and Minnesota that sent the most number of proactive tweets 150, and 105 respectively. 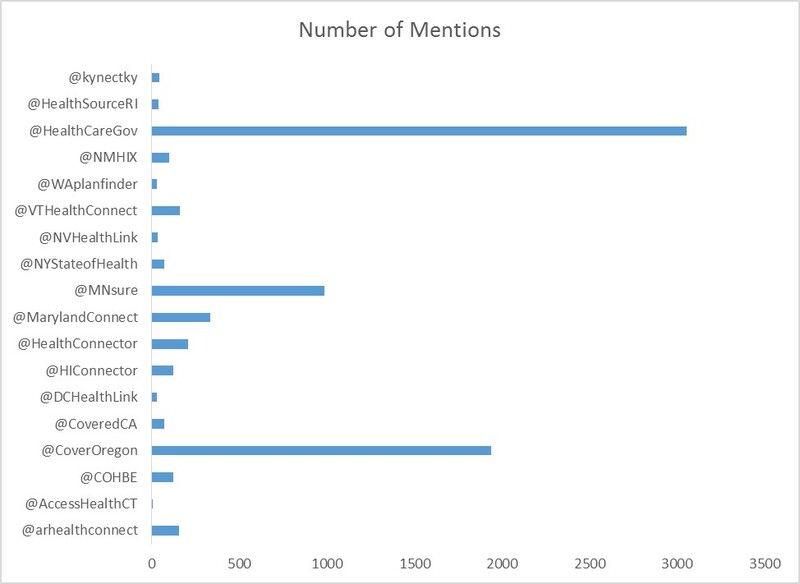 Unsurpringly, HealthCare had the highest number of mentions. Since Twitter is commonly used as a platform for customer assistance, the ART or Average Reply Time is an important metric to gauge how involved these health exchanges were in the time period analyzed. AccessHealth CT has the best average reply time, responding to 8 of its 13 replies within 15 minutes. MNSure also took less than fifteen minutes to reply – 22 out of 27 times. New York had the highest response rate, replying to 293 out of the 988 times they were mentioned with an ART of 2 hrs, 20 minutes. Of those 293 replies, New York took less than 15 minutes on 190 of them. On the whole, other than plain text, a request to view a link seems to be the most popular type of reply by the exchanges. The links provided most often redirected users to the exchange’s website to answer various queries. Links were also a high priority in the content strategy for Twitter, and seemed to engage well for most exchanges. Plain text that could offer the information to users, without having to click through to a secondary site, also engaged well. On the whole, the exchanges used Twitter to a) spread information about enrollment, deadlines, contact details and events, b) galvanize enrollment by frequent reminders and calls to action, and c) provide a secondary channel of customer assistance either by responding on Twitter, redirecting users to further information, or taking the query to private channels via DM, email or phonecalls. Most exchanges seemed comfortable with the platform, and were able to engage with potential customers, and existing applicants. One would have imagined that since videos aren’t as easy to produce as content for Facebook or Twitter, that none of the exchanges would have had new material for the last two weeks of March. However, eight exchanges uploaded at least one new video in this time period, with Oregon and California producing nine and seven respectively. California, easily the most social-friendly state exchange, had the highest number of all time video views with 2,488,078 views, followed by BeWell NM (299,054) and Your Health Idaho (248,762) . Your Health Idaho had the highest percentage growth in video views in the time period analyzed (more than 35%! ), although they hadn’t uploaded any new videos. The State Health Exchanges also pulled out their celebrities on YouTube. From Oscar Nominee Barkhad Abdi (Captain Phillips) for Minnesota, to LeBron James and Magic Johnson for HealthCare.Gov. State exchanges also strove to capture attention. Washington Healthplan Finder’s “Fly Baby Bird” is a tongue in cheek (we hope!) example of the fun that exchanges tried to have with their videos. Oregon too, highlighted local talent in a string of musical advertisements for Cover Oregon, which was the most viewed. However, it was usually the introduction videos, and the tutorial and informational videos that did best and got the most views. Of the 17 state exchanges, only two – Idaho and Kentucky — voted Republican in the 2012 elections. As the two states representing the GOP, a large portion of whom weren’t the biggest supporter of Obamacare, did they have a lot to prove? The answer is – undoubtedly. With more than 30,000 sign ups in the last 7 days, and one of the highest enrollment goals, Kentucky definitely proved their commitment to the implementation of Obamacare. On social media too, Kentucky definitely pulled their weight. They maintained a competitive engagement score of 837 on Facebook, which is in the Top 5 of engagement scores across state exchanges. Idaho, as previously mentioned, had the highest percentage growth in video views on YouTube, with more than 65,000 new views in the final two week period alone. Final Analysis: Social enough or too social for their own good? Although much has been said about the Obama administration’s attempts to capture the attention of that highly prized group of enrollees – “the youth,” we found that at least in the last two weeks, state exchanges stayed serious, and kept their focus on providing information on their social platforms. While they didn’t have the kind of celebrity endorsement and the “Galifinakis Bump” that the Obama administration was able to muster, they did make a concerted effort through their social media platforms to get eyes, and signups, on their websites, and it definitely worked, with all the exchanges reporting bumps in enrollment in the last two weeks. Back in 2012, a study by the Pew Research Group found that “66% of social media users—or 39% of all American adults—have done at least one of eight civic or political activities with social media.” With the knowledge that the number of social media users has gone up from 60% of online adults in 2012, to 73% in 2013, it made complete sense for the exchanges to involve three different platforms in order to amplify their message. Dr. Pamela Rutledge, Director, Media Psychology Research Center, published a great article on “How Obama Won the Social Media Battle in the 2012 Presidential Campaign” where she noted that “Social media also allows information and opinions to travel across networks, like ripples in a pond, amplifying ideas and allowing each person to participate as an opinion leader through media production and distribution, not just by passive consumption.” This has equal applicability now for Obamacare as well. Insurance is not an easy subject, but as more people are talking about it, explaining it and understanding it, there should be more people that get informed, and hopefully – get covered. It might be easy to easy to mock the efforts in the lead up to the deadline, but with the number of enrollments surpassing the 7 million mark (and this is set to increase with extended deadlines), it’s hard to deny the value of social media in the Obamacare campaign. Unmetric compiled this report by sourcing data & insights from its own benchmarking platform. Gain access to all this data and sign up for a free 6 day trial.